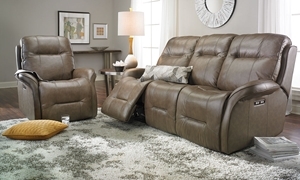 Dual power reclining sofa with extended full leg chaise design features remote-controlled power headrests and lumbar support. This sofa does it all with power reclining ends, power headrests, cupholders, reading lights, storage and charging ports. 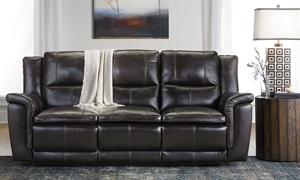 The classic sofa gets an update with contemporary styling, top-grain power reclining seats and power headrests. 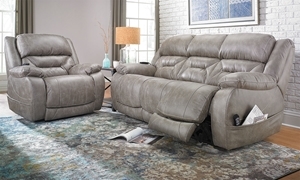 90-inch power reclining sofa with pillowtop arms in grey high-grade upholstery. 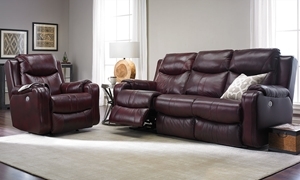 Power reclining sofa completely upholstered in deep burgundy leather features power adjustable headrests and USB charging ports. 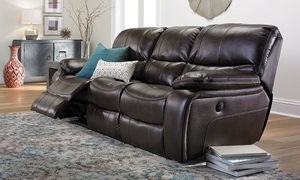 90-inch dual power reclining sofa with deep bucket seating tailored completely in leather and accented with nail head trim. 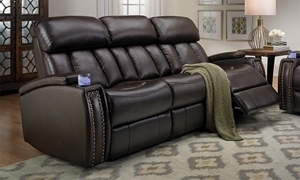 Fully padded chaise recliners with relaxing double pillow-back design and classic roll arm with nail head trim. 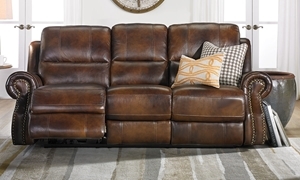 Sofa features one-touch power recline, as well as comfortable bucket seating and generously padded back and arms in brown leather gel. Chocoloate-colored power reclining sofa offers power headrests, charging ports, drop down table and more in one sleek package. 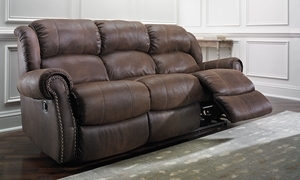 Traditional power reclining sofa featuring top-grain leather seating and shirred roll arms with nail head trim. 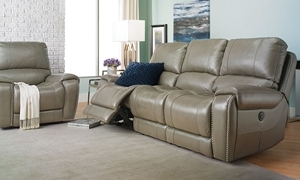 Power reclining sofa with ergonomic design, power recline, and memory foam cushioning. 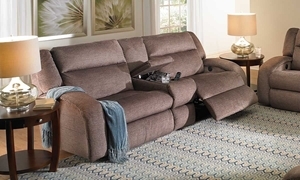 Everyone will love to curl up and relax on one of our fantastic reclining sofas. 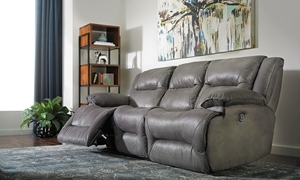 With our incredible selection of fabrics, leather, power and storage features, you’re sure to find the perfect piece for your home here at Haynes.